Not to be confused with Broadway Bound. In physics, the Bekenstein bound is an upper limit on the entropy S, or information I, that can be contained within a given finite region of space which has a finite amount of energy—or conversely, the maximum amount of information required to perfectly describe a given physical system down to the quantum level. It implies that the information of a physical system, or the information necessary to perfectly describe that system, must be finite if the region of space and the energy is finite. In computer science, this implies that there is a maximum information-processing rate (Bremermann’s limit) for a physical system that has a finite size and energy, and that a Turing machine with finite physical dimensions and unbounded memory is not physically possible. To put it more succinctly in a way that I can understand (that is, language that encourages me to eat doughnuts), The maximum amount of information that can be contained increases with mass. Mass/Energy. Whatever. More doughnuts for me. I must increase gain weight to get smarter. Yesterday, we took to various destinations to spend some gift cards gathered during Christmas. The boys and my beautiful wife had gift cards from ABC Books, Barnes and Noble, and Vintage Stock. Me, I mooched on their gift cards or just bought. The Sword of Genghis Khan by James Dark. It’s part of a series, but I got this, my introduction to it, because it involves a relic from the Mongolian leader. Also, fun fact: There is a Dark side to my family, and it’s not pseudonymbus. Of Reading Books, an address or commencement speech from 1929 bound in book form. Collections of Aristophanes and Euripedes. But not Genet. Why, yes, as it happens, while Heather was lingering over the sheet music, I lingered nearby, and that happened to be the drama and books about books section. 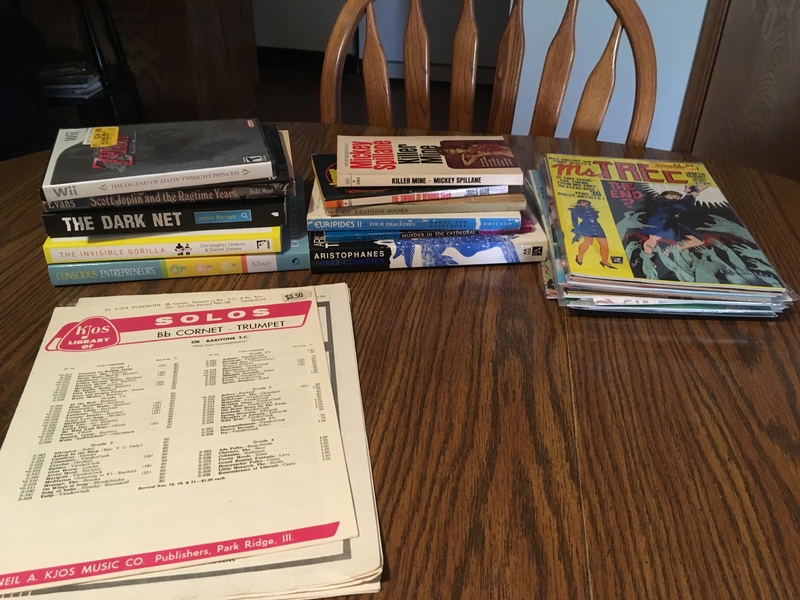 I also picked up eighteen of the dollar comics from Vintage Stock, which means I have not yet read my last comic book. Nor, probably, assembled my last comic book storage box. I bought this book on the last day of the local GAME Expo in October. You’ll have to take my word for it, as I did not post a picture of the things I bought on that trip. I bought it from the author, who traipsed all the way from Boston to sit at a table in Springfield, Missouri, to sell her books. I was her last sale of the day, as she was heading out to catch a plane home as we got to the game / science fiction convention on Sunday afternoon. At any rate, this is like, what, three in a row of self-published books that are pretty good? (Obsidian Son and The Leftovers being the others.) 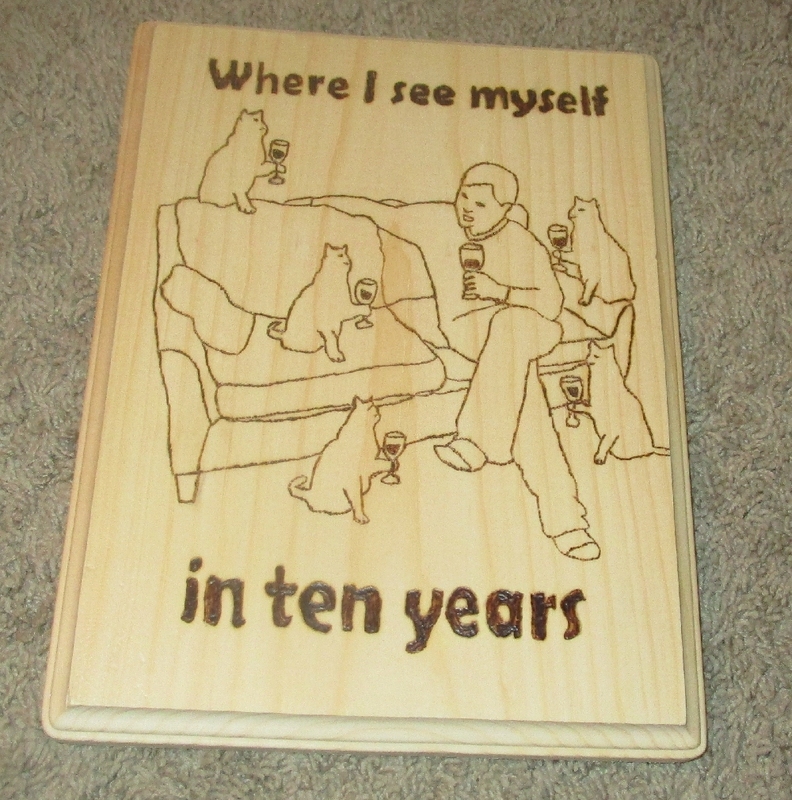 I’m a little afraid of delving into more self-published stuff for fear of ruining the streak. This young adult book centers on four teens on a remote outpost. 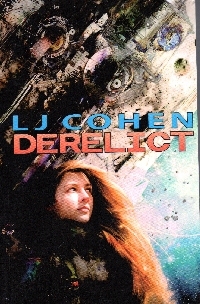 Ro, the daughter of the chief engineer of the station, is good with computers and whatnot; Jem and Barre are the children of the doctors of the station, and Jem is a good engineering student while Barre seemingly wastes his talents on music; and Micah, son of a disgraced Senator, who is trying to perfect a strain of a plant-based drug called Bitterweed to break the current cartel’s hold on the supply. Ro hopes to get to the university, and she hopes to revive a derelict crashed space transport as a project to show she’s competent. But the teens find guns in the hold with forged diplomatic seals on them and uncover a plot by the engineer and the senator to traffic the goods. A plot that requires Ro to awaken the ship’s AI and make the ship space-worthy. When she does, the confused space AI takes off from the asteroid in a panic, leaving the four teens scrambling to survive and return home even as they’re hunted by the government and the people who want their wares. It’s pretty good. It meanders a bit, especially towards the end, but I might just get impatient with books that clock in at almost 400 pages. Also, the derelict of the title is treated as ancient, but I believe the book says it crashed forty years ago. That seems a little recent for how ancient it’s portrayed. Even today, we have almost 100 year old ships sailing the seas and some of our airplanes are forty and fifty years old. Perhaps the author is trying to convey the youngsters’ perspective here. So I enjoyed the read, and if I catch the author at another fair, convention, or festival, I might pick up some of the later books in the series (I believe she brought four titles to Springfield, but was sold out of one of them). But I don’t think I’ll hop on the Internet and order them to catch up. That is just not my way. I always see instructions that say Enter Your Pa’s Sword, but, to my knowledge, my father never owned a sword. I do have my grandfather’s saber. Would that work? To be honest, I’m not even sure why my grandfather had a saber. I didn’t know him well; he died when I was four. From about the time of the bicentennial, it hung on the wall of our place in the projects, on the wall of the mobile home in the trailer park, on the wall of the house down the gravel road in the valley, and my mother’s house. At least here at Nogglestead, it’s not lonely. If this won’t work, I also have a filleting knife from my other grandfather. The title of this book certainly fits into the philsophy kinds of books that I might like to pick up. Its size (short and paperback) meant it would make a good carry book for me. It did. 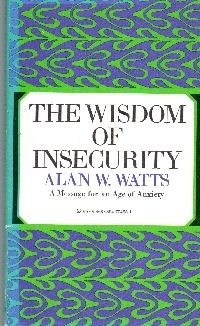 As I was reading it at the dojo, a very well-read teenager there recognized Watts’ name. After I finished it, I saw a Facebook image with a Watts quote on it. So his influence continues, some thirty-five years after his death. At any rate, this book was originally published in 1951, so it’s steeped in the Existentialist zeitgeist, but it’s not really an Existentialist book. Watt was at one time a clergyman, but he switched over to Buddhism as a relatively early American adopter (and he knew Shunryu Suzuki). So this is a bit of a spoiler alert. I detected some of the Buddhist themes in the work along with some response and comment on other philosophers’ work, but not so much by name. It’s a popular bit of philsophical musings. That is, it grapples with some of the main themes in life instead of being a comment on a particular school of thought. The gist of it is that life is changing and fluid at all times, and the more you try to crystallize it into something specific, you lose it. That is, defining a word takes something away from the thing being defined. Also, the early traces of the Mindfulness movement are here, he posits that only the present is real and the past and future are not. So we get into the real nub of Buddhist theory of consciousness, which ultimately doesn’t seem to work: The “consciousness” in the “present” is not the same thing as it was in the past nor is it the same thing that will experience the “present” different from this one. If you accept a certain evolution of the person, the being, the soul, you can sort of think this is right, but the Buddhist thought says, no, literally, the consciousness who came to my blog is not the same one that right now is finishing the third paragraph of this book report. So there are lessons one can take away from the book, which are basically the things you find in Mindfulness listicles all over the Web. Try to improve your mindset and adaptability to changing circumstances; let go of the past; don’t worry about the future; enjoy the present as it is. But unlike a listicle (and contemporary Mindfulness books written by the listicle authors), the book has depth in exploring some ontology and epistemology. So a good read, and apparently still relevant if contemporary high school kids, albeit precocious ones, talk about the author. 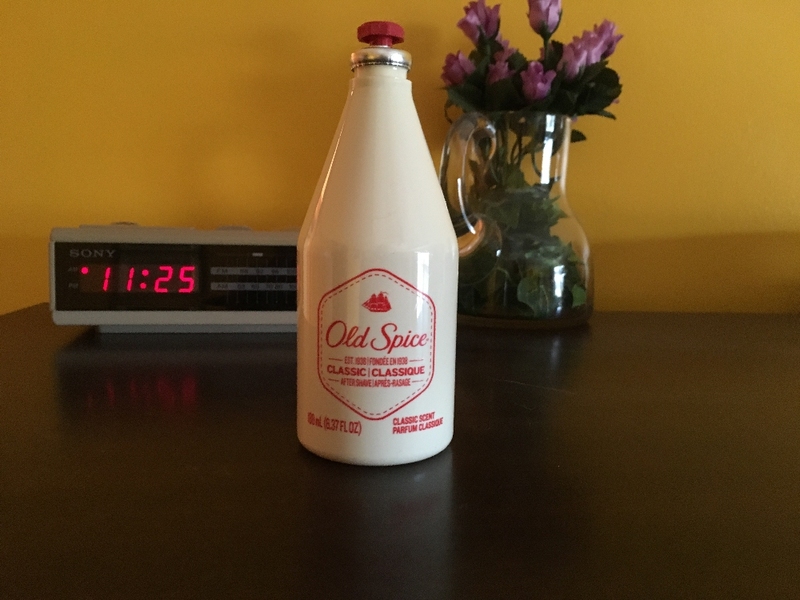 As some of you might remember, since I just mentioned it almost seven years ago, that I am working my way through a bottle of Old Spice cologne that I got in middle school. Well, I might have mentioned more recently on Facebook that I’m getting quite close to the end of the bottle, because my brother got me a new one. Which not only means that I will probably never get to the colognes that my National Honor Society Secret Santa Mrs Griffith gave me in high school. Also, doing the math, I realize that I will probably never use this bottle of Old Spice completely. When I die, one of my children will inherit it and might slap some of it on to smell like the old man sometimes, or perhaps it will go into the estate sale and make a quarter. Basically, my brother’s gift tells me that he thinks I smell bad and makes me dwell on my own mortality. Some gift, bro. My mother-in-law is a bit of a genealogist. 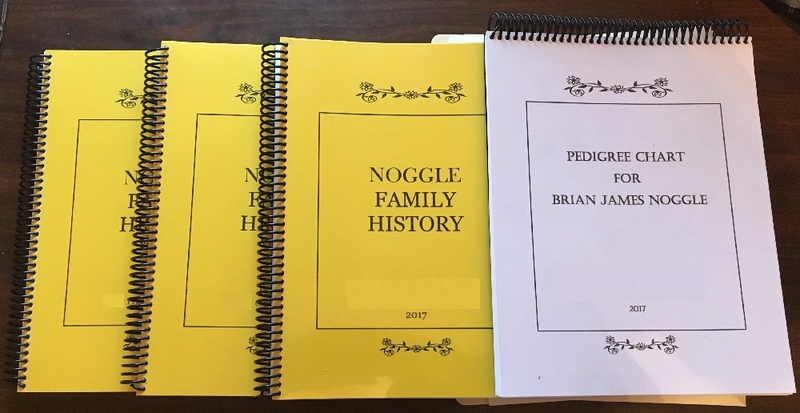 So this year, she spent seven months of hobby time working on the Noggle half of my family tree, and she created a four-volume compendium of her findings, culminating in a tenuous link to the English throne. Behind the scenes, she informs me, she has been eliminating families and entire erroneous lines as she found them. Which leads me, someone untrained in such matters, that she hopes to present me with the English throne in 2018. UPDATE:It suddenly occurs to me that she might not be doing this for me, but for her oldest grandson. Once the other claimants, including me, are out of the way, someone in her line will become King, and her daughter will rule during the regency. If anyone needs me, I’m going to binge-watch Game of Thrones for a primer on how to handle royal intrigue. Before it’s too late. As you might recall, gentle reader, I enjoy doing a bit of woodburning, which is essentially (at least in my case) tracing things with hot irons into wood. If you read any of the literature, it’s a time-honored art form, but essentially (at least in my case), it’s a bit of crafting that allows for some error and the result probably looks harder than the actual effort to do it. You can see some of my other handiwork in the Handicrafts category (along with book reports on crafting books. Well, it’s been a couple years since I went bonkers on the woodburning for Christmas (although, the historical documents in the aforementioned Handicrafts category indicate I made something for Christmas last year for someone). This year, though I made two things (and gave three). My cousin is a huge Volbeat fan. Maybe matched only by the Kyoshi of the martial arts school where I take classes. 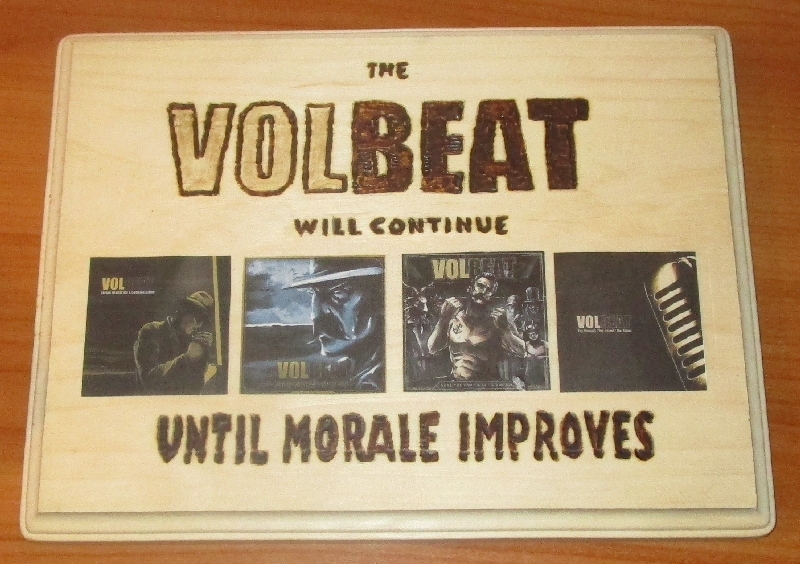 I’ve often wondered if they should fight it out for the title of Best Volbeat Fan, but that would hardly be fair. He’s a seventh degree black belt, but she is crazy. 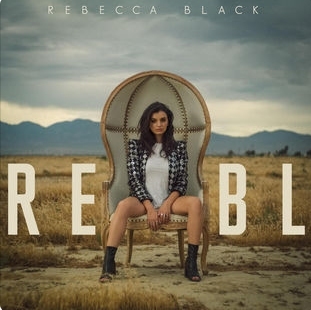 At any rate, she posted a Volbeat song every day when she was on vacation, and I immediately thought of this slogan. I originally planned to try to woodburn the album covers, but I chickened out, so I printed them and découpaged glued them on. I added just a touch of brown pastel to the first part of the logo, but it’s very subtle. It was a bit nerve-wracking, with the pattern being narrow lines for the most part, but I did okay. 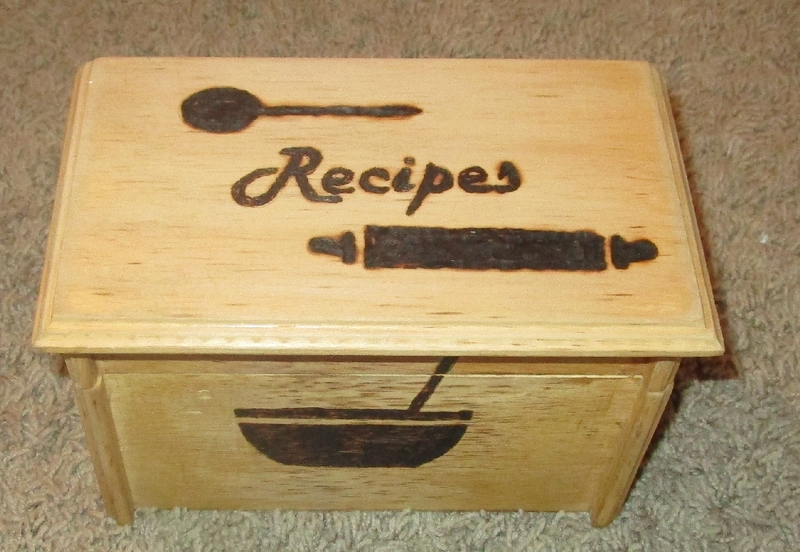 I bought an old recipe box at a yard sale, and I put some cupcakes on the sides, a couple utensils on the top, and hearts on the back. I meant to give it to her for Christmas last year, but after all the gifts were opened in Christmas 2016 and it did not appear, I found it in the gift closet, unwrapped. So it was one of the first gifts wrapped for 2017. I’m pleased with the things I’ve done, and I’m eager to try something else, but nothing in the last couple of weeks really inspired me. Sadly, I’m not a craftsman; I’m a dabbler, and I’ll probably only be such as I like the projects more than doing the projects. So I’m not driven to just sit and practice on scrap wood while waiting for inspiration to strike. Which it will. Undoubtedly, the end of next November, as Christmas draws near. Technically, the copy of this book that I read is the third book in a three-novel omnibus edition called 3 Martian Novels; however, the other two are Thuvia, Maid of Mars and The Chessmen of Mars, both of which I read earlier this year when I read the omnibus John Carter of Mars. I know my book reading accounting system is arbitrary: In my annual tabulation, the five volume omnibus is a single book, but the one novel that I read in this collection is one book instead of a third of a book, which is why my annual reading is currently at 83 instead of 87.33. But I’m accountable to no governing authority on this enumeration, so I’ll do what I want. Where was I? Oh, yes. In this book, we have another Earthman, a WWI soldier who dies in combat, transported to Mars. He ends up in the employ of a great scientist who has learned how to transplant just about anything–including brains from one body to another. The scientist, a supremely rational being, maps out a plan where he and the Earthman will swap each others’ brains into new bodies every thousand years or so, essentially conferring immortality upon each. The plan goes awry when the Earthman meets the mind of a sweet young Martian woman whose brain has been swapped with into the body of an aged despot, and the Earthman vows to put things aright. 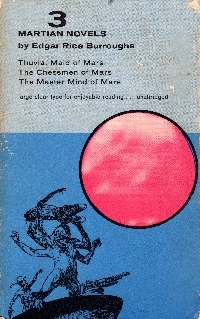 It’s a pretty quick little yarn; John Carter makes the obligatory appearance at the end, but Burroughs has already learned by book 4 of the series that after elevating the main character to the pinnacle of power (John Carter became the jeddak of all jeddaks in the third book) that it would be wise to focus on other, more approachable characters whose struggles would still be acute and adventurous, in the series. So many series keep heaping power, fame, and whatnot on the series characters so that they’ve continually have to find ever more powerful struggles and villains to fight, and the characters end up caricatures or so powerful that the reader cannot identify with the protagonists. Bully on Burroughs for avoiding this trap. Also note that my estimation of this book is probably higher because I haven’t read five or six in the series in a row. Mixing the series books in with other books helps keep them fresh, hides some of the formula, and helps each stand alone instead of being instantly comparable to the last one read. So I should take that to heart, although I’ll probably still read omnibus editions as a single book. Except maybe the Detective Book Club books. It happens from time to time: The rural mail carrier puts an item from the next stop down the line in our box. Sometimes we get something from the next farm road over that somehow got caught in a machine or stuck to one of our pieces of mail in processing. Lockwood, Missouri, is fifty miles from here. 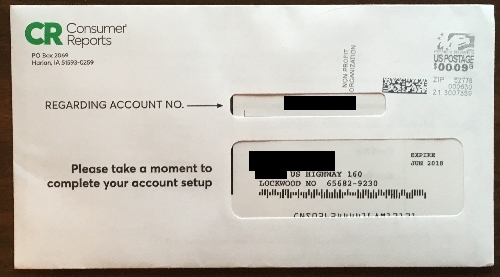 Clearly, that got misfiled quite a bit upstream from our local post office. This is the best disco flute album I’ve ever heard! 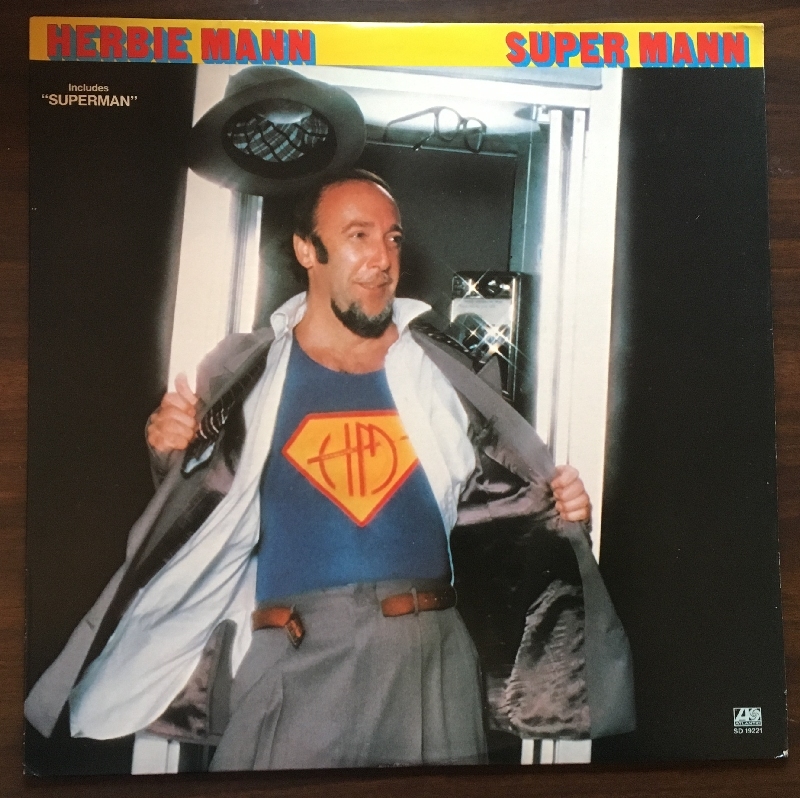 I am referring to Herbie Mann’s Super Mann. I’ve got a couple of Herbie Mann’s more straightforward jazz, but this disc, which I picked up for $.99 this weekend, is a singularity of sorts. It has attained an infinity of 1978 coolness. I defy you to find anything better, or anything that does not appear on the soundtrack to Anchorman: The Legend of Ron Burgundy that comes close. This book represents my annual Christmas book, and it’s the one I bought most recently (https://brianjnoggle.com/blog/2017/10/14/good-book-hunting-friday-october-13-2017-friends-of-the-christian-county-library-book-sale/” target=”_new”>October, in fact). Although I’ve bought a couple more such books this year, they’ve hidden amongst my to-read shelves, whereas this book was still relatively front and center. So although I undoubtedly have destiny that includes one or more Kinkade paintings, I doubt I’ll revisit this series. Well, fortunately, I forgot that particular New Year’s Resolution, as this book was better. A pastor visiting Cape Light while he recovers from malaria collides with a pregnant woman on the run and under an assumed name on a snowy evening. 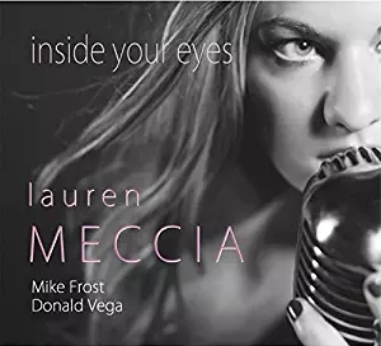 He helps her out, and they start to have feelings for each other, as she hides out in a boarding house and integrates into the friendly community until a private investigator hired by her vindictive ex-husband shows up. Side plots include one daughter of a wealthy widow wanting to marry and another daughter dealing with the lingering effects of a miscarriage and her husband’s attention paid to a needy boy at a local shelter. Overall, a pleasant book to read. A nice bit of fiction without major crimes involved, but enough intrigue with the woman on the run story to keep a genre-fan like me engaged. Which might be what the other Cape Light book I read lacked. 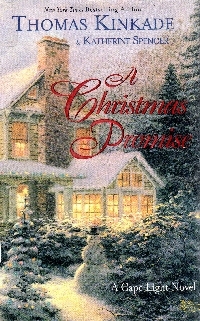 It has its unanswered questions: What, exactly, is the promise in the title? How did the detective find her? It rather quickly covers the whole holiday period with big gaps, and then it drills into conflicts that might have been resolved within those intervening weeks, but do not. That’s a flaw I see in some television programs, too. Now, back to the genre fiction for me. 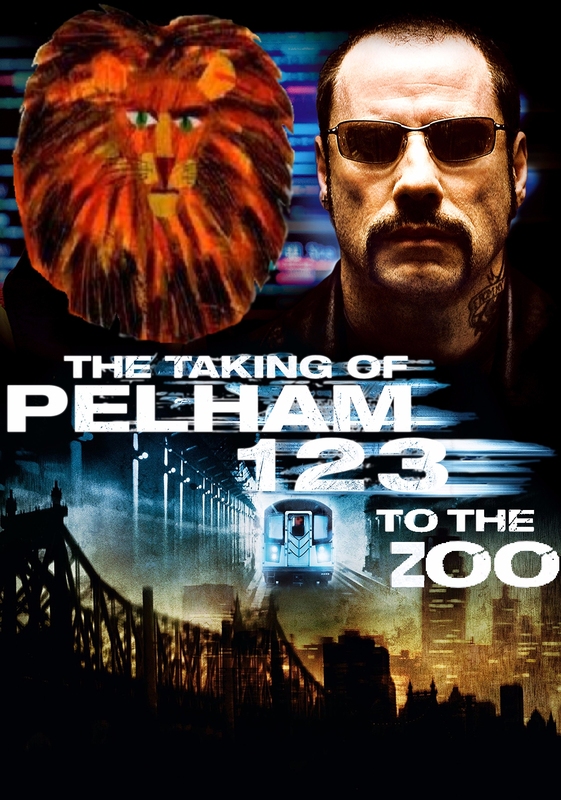 Come on, it’s a mash-up of 1, 2, 3, to the Zoo, a children’s book by Eric Carle, and John Godey’s gritty thriller The Taking of Pelham 123. Of course, I probably didn’t have to explain that to you, gentle reader. Certainly you are well-read, or at least used to my obscure sense of humor by now. When it’s time to leave somewhere, I still say to my children, “1, 2, 3, to the zoo.” But they’ve started to doubt our destination is actually the zoo in these instances. Is That The Name of the Song or the Name of the Band? I’ve often asked this when presented with the written title of a song and a band I’ve not heard of. Mostly, I’m joking. But when I learned that Fozzy has a song (and album) called "All That Remains", I thought that was funny because there is actually a band called All That Remains (whose album I bought before I bought Fozzy’s Judas this autumn). So I got to thinking: What other bands have songs that are actually the names of other bands? The song cannot be about the band or act. So Taylor Swift’s “Tim McGraw” would not count. The title of the song must be the complete name of the band and must not just include the band name (sort of) in it. So “Like a Rolling Stone” and “Papa Was A Rolling Stone” would be out. Scoring would have to be based on the number of words somehow; one word titles/band names are easy, so maybe a multiplier of some sort. Montgomery Gentry, “Hell Yeah” (although Hellyeah presents it as one word–I’m not sure if that would be disqualified under the second rule how to score it–one word or two–if it’s allowed). Prince, “Kiss” (the band in 1991–those old men back then look pretty young now). The Alternate Routes, “Nothing More“, (band). Confession: I did an Internet search to get the last one, so I’ll leave it to those of you who want to play along to search for obvious choices like Breathe, Heart, and Jewel. It’s been almost six months since I’ve read a Bolan book (Death Has A Name in July), and this book is 17 books later in the series. Thicker than the old Bolan books (a transition I noted in the previously mentioned review), this one might be a touch better, but it’s still a bit dissatisfying overall. Within this volume, Bolan is in New York when an ambassador from Vietnam who is making back channel overtures for normalization of relations with the United States is assassinated. Bolan is riding with a cop who happened to be an old war buddy, and they pursue the assassins. 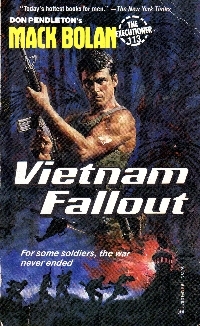 The friend is cut down, which sends Bolan on a search for vengeance that leads him to Vietnam. Although this book kinda treats this like it’s a fresh return for Bolan, we who read the books instead of write them for hire recognize that he has already been back in a book entitled Return to Vietnam. Once in Vietnam, Bolan engages in a rehash of Heart of Darkness–or maybe Apocalypse Now, the original rehash of Heart of Darkness set in Vietnam, albeit during the actual war. As he follows that plot line, he engages in some questionable decisions that seem to go against the marrow of the character for future plot twists. And then the book reaches its shoot-out climax, and Bolan wins. The first part of the book, in New York, has a different feel from the second half. One wonders if two incomplete manuscripts were grafted together to make one longer book. Or, one fears, maybe the remainder of these books will be like this. Which would be awful, since one has a lot of these later books from scattered places in the 400 or 500 book canon. As I’ve mentioned, I’m coming my archives to ensure posts have categories, and it’s an interesting and tedious process, but it uncovers a lot of nuggets. Like this post, where I tell Steve Jobs the iPhone should have voice interaction. I wonder if that’s actionable? Surely, some shady attorney somewhere would give it a wing.